Tones, smooths and stimulates skin. 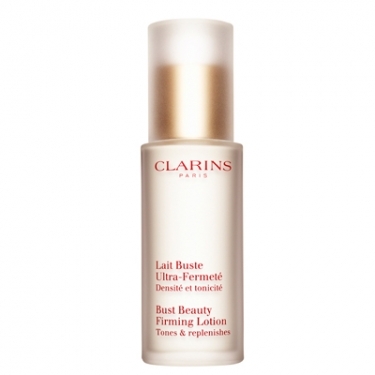 Lait Buste Ultra-Fermeté da Clarins (Bust Beauty Firming Lotion) is a firming anti-lotion to tone and shape your breasts. This formula is based on centella asiatica, grananda extracts, vitamin B5 and E to firm, protect and hydrate skin. Complement with day care treatment Bust Beauty Extra-Lift Gel. Apply P.M at night before bed with upward motion from the base of your breasts to the chin.